This whole journalism thing started out with a desire to be a storyteller. My dad is one of the best auditory storytellers anywhere, and I wanted to be just like him. I remember writing poetry and short stories many years ago. I have numerous journals filled with my notes and stories from childhood. I never made a big deal about it, because it was a compulsion I didn’t really understand at the time. But I remember my brother wrote a story about fighter planes and dog fights that really captured the interest of my parents. They lavished praise on him, and rightly so. He wrote an exciting story that had a beginning, middle and end with an exciting climax and lots of action. I remember feeling really jealous of the attention he got for that story. I felt that I was the writer in the family and that he was good at so many other things. Eventually I realized that he wrote that story from an interest in planes and dog fights rather than any interest in being a writer. My brother has a very scientific mind that relates to complex ideas in a way that breaks them down into usable chunks. His story fascinated me because of the way he used his own words to relate what he understood about airplanes. I wanted to tell stories like that. Print journalism seemed a natural fit for me with its adherence to form and style. But early on I realized that print could only tell part of the story based on the audience. I knew that many people glance at the newspaper and maybe read the headlines or view the photos. A smaller percentage actually read the front page of the newspaper from top to bottom, and an even smaller minority read beyond the front page. And yet news still is disseminated. Some of it is word of mouth or water-cooler conversation. Sometimes articles are clipped out or forwarded via E-mail. Little bits of information get out into the wider population in spite of newspaper reading habits. One of the reasons I gravitated toward online journalism is because of a desire to tell stories and reach people where they are at. I always felt a little useless writing stories about the county that were read by county workers and subscribers over 65 who still had the habit of reading every story in the paper. Videos and podcasts and multimedia Web stories fascinated me in their ability to reach a wider audience, and I quickly realized that online storytelling could erase the boundaries and stretch the canvas of storytelling to infinity. People often ask me about why I chose online journalism instead of sticking to writing stories. Stories are pieces of life that when put together artistically form our collective history. More than that, good stories become part of the fabric of society upon which we build our empires. Stories are pieces too, and most storytelling today puts the pieces together quickly and tries to distribute that story to as wide and audience as possible. But so many pieces are missing still. A good story teller uses many tools. If an elder telling stories wants to capture his audience, he uses the inflection of his voice and hand movements. He makes himself small at times to emphasize the vastness of his tale. The visuals of his storytelling are as important as the words he uses to tell the story. That has remained the same since the beginning of time. The printing press changed that somewhat as text dominated illustration. Today a good storyteller has options well beyond a text-based story. In fact good storytelling includes many elements beyond text. I think of how many stories were written during the recent election about the impossibility of winning a write-in campaign. 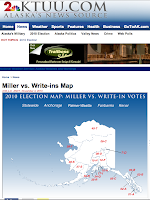 Text-based stories sought to explain that certain sections of Alaska’s interior were united in their support for one candidate, while other enclaves in larger cities supported another candidate. 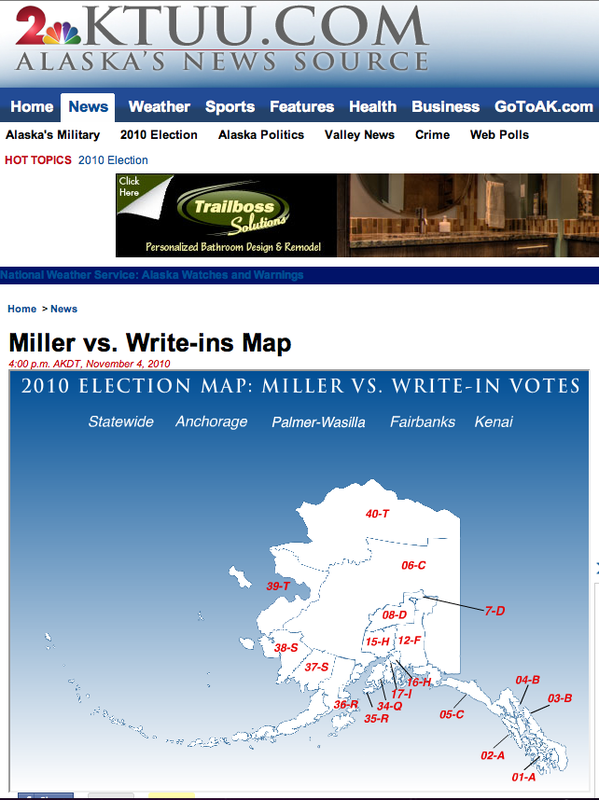 It was all very confusing to try and read between the lines to see where the state of Alaska actually cast its vote. Good storytelling finds the best tools to tell each story. So in yesterday’s news meeting, someone suggested making a visualization of how each part of the state of Alaska voted for the contentious U.S. Senate seat held by Lisa Murkowski. I came back to the Web team and asked the designer, Jeff Rivet, if he could cannibalize another flash map he’d made of the state and show us how each section of the state voted in what could be a historical win for a write-in candidate. It’s not the whole story, but it’s a piece that contains elements of the whole story, and it’s both visual and text based with moving parts. I love thoughtful storytelling. I love when a visual can replace a bunch of text in explaining a complex idea. Journalism is far from dead. And as storytelling has evolved from the beginning of time with small changes and history changing movements, we are in a transitional phase where the art and craft of story are moving beyond older technology on the shoulders of new technology.